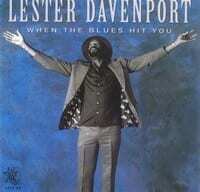 Until 1992, Lester Davenport's chief claims to blues fame were the 1955 Bo Diddley Chess session he played harp on (it produced "Pretty Thing" and "Bring It to Jerome") and a lengthy, much more recent stint holding down the harmonica slot with the multi-generational Gary, IN, band, Big Daddy Kinsey & the Kinsey Report. That instantly changed with the issue of Davenport's own album for Earwig, "When the Blues Hit You," and the follow up on Delmark, "I Smell A Rat." Now this Chicago blues veteran had something on the shelves to call his very own. Davenport hit Chicago in 1945 at age 14. He quickly soaked up the sights and sounds so prevalent on the local blues scene, checking out Arthur "Big Boy" Spires, Snooky Pryor, and Homesick James, who invited the youngster to jam sessions and tutored him on the intricacies of the idiom. Gigs with Spires and James preceded his brief hookup with Bo Diddley (which included a booking behind Diddley at New York's famous Apollo Theater). Davenport led his own band while holding down a day job as a paint sprayer during the 1960s, remaining active on the West side prior to joining forces with the Kinseys during the 1980s. Now, about that "Mad Dog" handle: it seems that Davenport liked to prowl the stage while playing a few notes on every instrument on the bandstand during his younger days. The shtick earned him the name; his tenacious playing did the rest. Aside from all of his great credentials, Lester was a wonderful man who was eager to welcome new friends and share his harmonica secrets to aspiring players. He had a warm smile and the ability to add humor to any situation. His harmonica playing will be remembered for its glorious, sweet tone and perfect phrasing. Although he'd been on the Chicago scene since the 1950s, backing Bo Diddley on some of his earliest Chess waxings, this was harpist "Mad Dog" Lester Davenport's long-overdue debut album. And a fine one it was, too, filled with mainstream Windy City blues immersed in the '50s tradition. His band for the project included pianist Sunnyland Slim and guitarist John Primer.